When traveling through Myanmar (Burma) you will without a doubt find someone enjoying a salad made mainly of fermented or pickled tea leaves, ginger, and an assortment of other fresh ingredients. 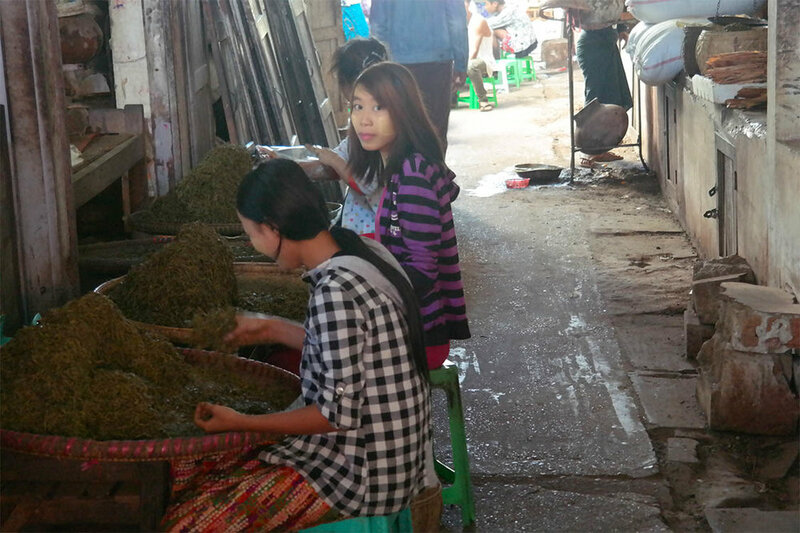 Myanmar is one of only a few countries where tea leaves are eaten, and the pickling of the leaves is unique to the region. In Burmese, this dish is called “lahpet thoke”; lahpet meaning green tea and thoke meaning salad. Historically in Myanmar, tea leaf salad was an ancient symbol of peace being exchanged and consumed after a conflict by opposing kingdoms. While living and working in Myanmar (Burma), many times villagers would invite me into their homes to sit with them and have tea leaf salad and a cup of tea. The sharing of food and drink with another is a very symbolic gesture of friendship to the Burmese people. Generally, fermented tea leaf salad is a mixture of ingredients with the most prevalent flavor being that of the tea leaves. Other common components of the salad are roasted peanuts, roasted beans, sesame seeds, garlic, tomato, dried shrimp, and a pinch of salt. The ingredients are usually served in separate dishes or piles so that guests can make a mixture that is best suited for their taste. The process by which the tea leaves are fermented is quite unique as well. First the best juvenile tea leaves are selected from tea plantation and are steamed for about 5 minutes. Then the tea leaves are flattened and pressed with weights in bamboo vats to remove excess water. The vats are places into pits dug into the ground and the leaves are regularly checked to ensure the process is going smoothly. The entire fermentation process can take up to 4 months to complete for the very best product. Another common Burmese salad is “gin thoke”, or ginger salad, with of course ginger being the main ingredient. Ginger is known to have quite a strong flavor; however, the ginger is again pickled before use. The process by which the ginger is pickled is much more simple and you could even try it at home. Fresh ginger should be thinly sliced into the size and shape of matchsticks, then soaked for at least 12 hours in lime juice. The pickled ginger is then combined with a mixture of chickpeas and lentils soaked in water and then fried in peanut oil with sesame seeds then mixed with garlic, chickpea powder, shredded cabbage, thinly sliced onion, peanuts, fish sauce, and fresh chopped chili pepper for a little kick. The combination of ingredients makes for a deliciously refreshing and crunchy salad. Some Burmese people even claim that this dish is good for the stomach, partially due to the ginger. These traditional salads are a staple in the diet of the Burmese people. Most locals refer to the salads as “fast food” since the ingredients are readily available and can be purchased already prepared at the local market or by a street vendor. No trip to Myanmar would be complete without trying one of these delicious salads. Contact Us for more information on Burmese cuisine and traveling in Myanmar.